You just finished plowing for the day. You’re tired, but you flick on the news anyway to see the snowfall totals that were reported. Well to your surprise, the news said 8 inches fell, you measured 9 inches, but a guy on Facebook said he had 10 inches all in the same town! What gives? Unfortunately, you cannot trust every snowfall amount you hear as people may be measuring incorrectly, in the wrong locations or even including snow cover from a prior storm. Let’s talk about some errors that may result in the discrepancy. As humorous as it may sound, the first potential, common problem is a slanted ruler. There have been numerous cases of snowfall measurements sent in to WeatherWorks with a ruler not perpendicular to the ground, yielding higher amounts than what has actually occurred. Blowing and drifting scenarios also wreak havoc on snow measurements as one portion of your yard has nothing and another has 2 foot drifts. And with early and late season events, pavement accumulation can drastically differ from colder, shaded sidewalks. Some outlets try to quality control the snowfall amounts but they still cannot always be trusted. You’re dealing with thousands of dollars in snow removal billing and accurate amounts are crucial. 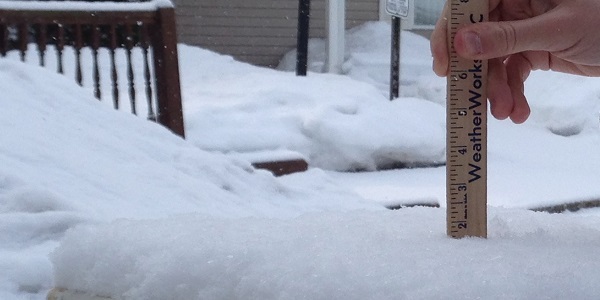 ﻿So, how do you find the correct snowfall amount for your zip code? ﻿The best way is to use one source that has a strong reputation for accurate and trusted snowfall totals, like WeatherWorks Certified Snowfall Totals™. These snowfall amounts are quality controlled by a meteorologist, who analyzes every piece of storm data available from radar to webcams to volunteer observers, to assign the most accurate snowfall totals down to zip code resolution. Reports are even completed for ice accumulation from freezing rain and each wintry event includes a summary breaking down the storm from start to finish. Finding an accurate and reliable source for snowfall totals is a growing trend in the snow and ice industry. Including these reports with billing will build a strong relationship and increase professionalism with your clients, as they will find comfort that you are billing based on a meteorologist certified snowfall report. And isn’t building a good reputation and trust in your snow removal services what it’s all about?